I am extremely meticulous and detail oriented. I believe in personal communication with the patient. When you call here, a computer will never answer the phone. I believe in all my personnel sharing my values. Empathy with the patient, communicating in a way the patient can understand, spending time listening to the patient and then describing things in a way that is easy to understand and spending time answering their questions. I put a high priority on my nurses. We're a solo practitioner, so you don't get lost in a big practice; there's a uniformity of care, instead of it being splintered amongst different physicians. I also feel that my practice is unique in that I have excellent training. I went to Vanderbilt Medical School and did an internship in neurosurgery. 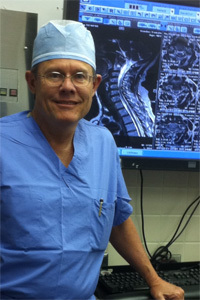 I spent 7 years in neurosurgery at North Carolina Baptist Hospital. I did a fellowship at Presbyterian University Hospital, associated with the University of Pittsburgh. I had the intellect to absorb my training and I put myself in the best areas to get the best training. The government lists me as the only 5 star neurosurgeon in central Georgia. Degenerative instability, tumors, congenital abnormalities, infections such as abscesses or osteomyelitis, herniated disc, stenosis, neurogenic claudication. I also am interested in the most effective method of surgery; too many "buzzwords" that are exposed to the patient - minimally invasive, laser surgery, etc. Every patient and every case is different, and care must be taken to use the most effective treatment rather than a "popular" one. It's extremely important to be an educated medical consumer. I spend a lot of time showing patient their x-rays, I show the patient their myelogram, CAT scans, MRI, and explain films to show their pre-op condition or how they are progressing post-op. I use anatomical models, diagrams to explain the anatomy of their pathology. I use models, pamphlets, diagrams to show the type of surgery we're proposing. I speak in layman's terms so they understand what the problem is, what we're proposing to do about it, and how the post-op course will go. What are some of the spinal conditions that you treat? We treat cervical disc ruptures, cervical myelopathy, cervical instability, trauma, lumbar disc ruptures, degenerative lumbar stenosis, neurogenic claudication, lumbar radiculopothy, and X-Stop decompression to name a few. We perform anterior cervical discectomy and fusion, lumbar microdiscectomy, lumbar decompressions and facetectomy, lumbar stenosis, internal reductions and fusions with titanium screws, spinal cord stimulator, artificial discs, and cervical disc arthroplasty. FDA Investigator - Human Bone Morphogenic Protein for spine fusions without use of patient's own bone. Did approximately 10% of all cases - Medtronic Corp.